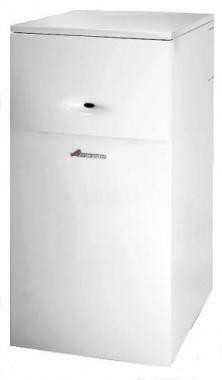 Greenstar FS CDi Regular boilers are floor standing models. As a result they are ideal when replacing an old floor-standing boiler or if a wall-mounted boiler isn’t suitable for you. These boilers have been sympathetically designed with a flexible flue allowing for chimney installation, multi-directional fluing providing increased siting possibilities due to a built-in condensate pump and a roll-in feature, which minimises risk of flooring damage. Greenstar FS CDi Regular boilers have fascia-mounted heating temperature control knobs and neon operational status indicators, making them very user friendly. Additional features include built-in frost protection, fault finding diagnostics, and an energy saving anti-cycle control. Furthermore, these boilers have the advantage of being compatible with Greenskies solar water heating system. This particular boiler has a central heating output of 30kW with an impressive efficiency rate of 92 per cent. And of course, like all the Greenstar's, this boiler is recommended by the Energy Saving Trust. If you're looking for a bit more power, the Greenstar FS 42CDi Regular is a great alternative.